Oral carcinoma is identified as one of the top ten cancers worldwide, accounting for nearly 2% to 5% of all cancer cases.1, 2 In 2014, there were an estimated 42,440 new cases of oral and pharyngeal carcinoma. While cases of oral carcinoma have decreased over the last few years in the United States, oropharyngeal cancer is increasing in incidence.4 The rise in cases of oropharyngeal cancer may be related to viral and infectious diseases; however, the mechanisms are largely unclear. Some of these infections and viruses include human papilloma virus (HPV), periodontitis, candida albicans, syphilis and herpes simplex virus.7 However, for the purposes of this case presentation, only oral cavity cancer will be discussed. MC is an 82-year-old white female who visited her primary care provider’s office complaining of a mouth sore. The sore was present for approximately six months, and grew increasingly painful. She has worn dentures for more than 10 years, and was accustomed to the typical soreness with irritation sometimes associated with everyday denture use. With this particular occurrence, the soreness lingered in the same area and lasted longer than any previous experience. MC attempted to alleviate the soreness with an existing prescription for hydrocodone. This treatment proved unsuccessful. MC scheduled an appointment with her primary care provider, as she assumed the pain was the result of ill-fitting dentures. At MC’s initial appointment, the provider noticed a 7mm erythematous lesion on the lower interior aspect of her right molar, and suggested it could be the result of her ill-fitting dentures. Because MC had exhausted her hydrocodone, the provider prescribed tramadol and a viscous lidocaine suspension for pain. She was told to follow-up with her dentist once the sore completely healed in order to be fitted with new dentures. She was instructed to refrain from denture use until the sore had resolved. There were no further follow-up instructions given. One week after the initial visit, MC returned to the primary care provider’s office because of increasing pain and discomfort. During this visit, the provider noted the sore had ulcerated edges that were friable and showed little improvement. She was referred immediately to an otolaryngologist for the suspicion of carcinoma of the oral cavity. MC is an 82-year-old widow. She is a Medicare recipient living in government-subsidized housing for the elderly. MC smoked tobacco between the ages of 17 and 52 at a rate of 1.5 packs per day, or 53 pack years. During the same 35 year time frame, she drank 1 to 2 alcoholic beverages daily. Over the past 10 years, she lost a total of 40 pounds without any lifestyle modifications to justify the weight loss. At the time of MC’s initial primary care visit, she weighed 91 pounds. Additional patient history included hypothyroidism, mitral stenosis, gastroesophageal reflux disease, coronary artery disease, arthritis and hypertension. Refer to the table below to help you rule out other conditions. A surgical biopsy was performed in order to identify the causative organism. MC was diagnosed with stage IV malignant squamous cell carcinoma of the right retromolar trigone, as well as squamous cell carcinoma of the right middle and lower lobe of the lung. The patient had no lymph node involvement. Because of her increased age and nutritional status, MC did not qualify for multimodal treatment. Instead, she is being treated with aggressive radiation therapy over a period of 12 weeks. Understanding key factors related to MC’s case — increased age, history of tobacco and alcohol use, and ill-fitting dentures — is paramount when identifying the painful, non-healing, 7 mm lesion in her oral cavity as a potential diagnosis of oral carcinoma. Increasing interprofessional collaboration amongst dentists, nurse practitioners, physician assistants, physicians and medical students has shown to be effective in implementing the head, ears, eyes, nose, oral cavity, and throat (HEENOT) assessment into practice.14 While this is similar to the head, ears, eyes, nose and throat assessment, it allows for the integration of the oral cavity into the evaluation of the head and neck exam. One study, conducted between 2008 and 2014 at New York University, revealed that the result of HEENOT implementation led to 500 patient referrals to dental clinics for suspicious oral lesions.14 Preventative measures at the primary care level should focus on the greatest risk factors (tobacco use, alcohol consumption and ill-fitting dentures). Amber Crossley practices as an advanced registered nurse practitioner in Jacksonville, Florida. 1. Piemonte ED, et al. Relationship between chronic trauma or the oral mucosa, oral potentially malignant disorders and oral cancer. J Oral Pathol Med. 2010;39(7):513-517. 2. National Cancer Institute. Stat fact sheets: oral cavity and pharynx cancer. http://seer.cancer.gov/statfacts/html/oralcav.html. 3. Rethman MP, et al. Evidence-based clinical recommendations regarding screening for oral squamous cell carcinoma. JADA. 2010;141(5):509-520. 5. Manoharan S, et al. Ill-fitting dentures and oral cancer: a meta-analysis. Oral Oncol. 2014;50(11):1058-1061. 6. Freedman ND, et al. Fruit and vegetable intake and head and neck cancer risk in a large United States prospective cohort study. Int J Cancer. 2008;122(1):2330-2336. 7. Meurman JH. Infectious and dietary risk factors of oral cancer. Oral Oncol. 2010;46(6):411-413. 9. Jefferson GD. Adult with oral cavity lesion. AAO-HNSF Patient Month Program. 2011;40(5): 1-25. 10. Arya S, et al. Head and neck symposium: imaging in oral cancers. Indian J Radiol Imaging. 2012.22(3):195-208. 11. Akram S, et al. Emerging patterns in clinico-pathological spectrum of oral cancers. Pak J Med Sci. 2013;29(3):783-787. 13. Institute of Medicine. Improving access to oral health care for vulnerable and underserved populations. https://www.iom.edu/Reports/2011/Improving-Access-to-Oral-Health-Care-for-Vulnerable-and-Underserved-Populations/Report-Brief.aspx. 14. Haber JH, et al. Putting the mouth back in the head: HEENT to HEENOT. Am J Public Health. 2015;105(3):437-441. 16. Cohon LA. 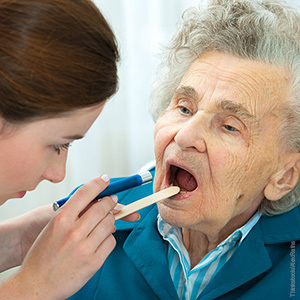 Expanding the physician’s role in addressing the oral health of adults. Am J Public Health. 2013;103(3);408-412.